We will be providing all the roping materials but please BYO pot or vase to sit inside (this allows you to adjust the hanger to size if needed). You will learn how to make a basic macramé plant hanger. The workshop is suitable for beginners and all materials to make the hanger are supplied, however please BYO pot or vase to sit inside (this allows you to adjust the hanger to size if needed). Pots or vases of around 10-15cm in diameter are recommended; this could be a large tin can, pickling jar, glass vase or terracotta pot… get creative. 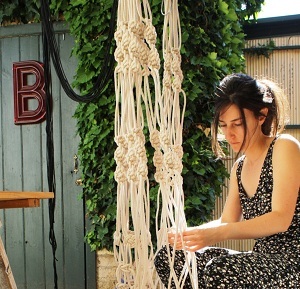 Bianca has a thing for knots and a thing for all things vintage so macramé is right up her alley. She hand-crafts macramé plant hangers in Adelaide under her label Play Pieces and must’ve been an ace shoelace tier as a wee kid. She loves crazy and creative ventures and good company, which may be why she names her macramé hangers and gives them all a personality. Meet Serge, Brigitte, Françoise, Quincy and Dusty at www.playpieces.com.au. Play Pieces plant hangers are like the whimsical beauty of a vintage design who’s invited a cooler and more sophisticated modern friend over to play. Oh the mischief those two get up to!